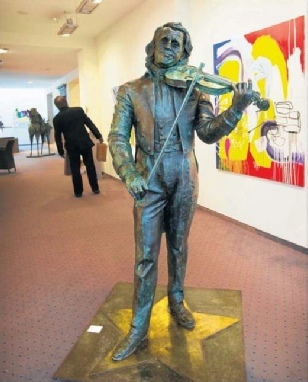 We have been told that André’s bronze sculpture was created in 2009 by the Russian artist, Alexander Taratynov living in Maastricht, on his own initiative. 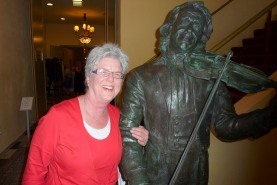 To read the newspaper article in the Harmony Parlor, dated June 2014: Click HERE. 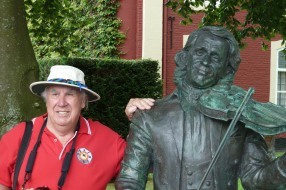 Alexander Taratynov (in the picture to the left). Alexander Taratynov (born in Moscow, 1956) was born into a family of artists. After his study at the Art Lyceum in Moscow, he studied at the sculpture department of the Surikov Art Institute in Moscow from 1975 to 1981. Taratynov has made sculptures for public spaces in various European countries including Switzerland, Germany, Latvia and Russia. 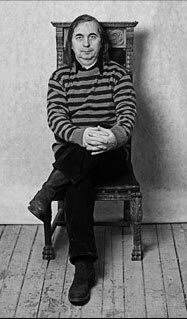 His work has been exhibited in the Pushkin Museum, the New Manege and the Academy of Fine Arts in Moscow, the Jardin du Luxembourg in Paris, Central Park in Shanghai, the Tsarskoye Selo State Museum in Saint Petersburg, and the Bonnefanten Museum in Maastricht, the Netherlands. 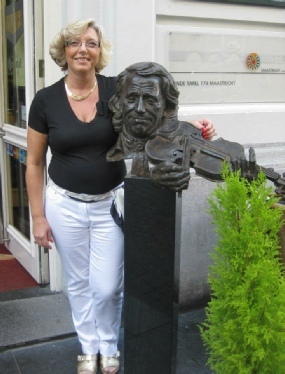 In the picture: Iris Schilling with her mother in law in 2010. 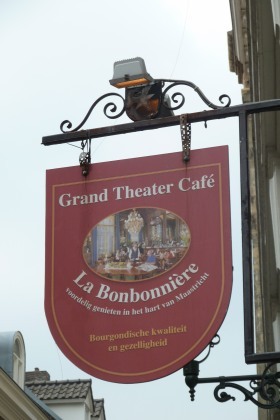 In 2011 the sculpture was moved from the café/restaurant to the entrance hall of the Bonbonnière theater (next door), where André started his career. 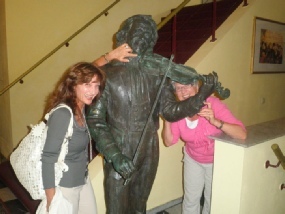 Joking and having fun with friends, that is what the Maastricht concerts stand for. 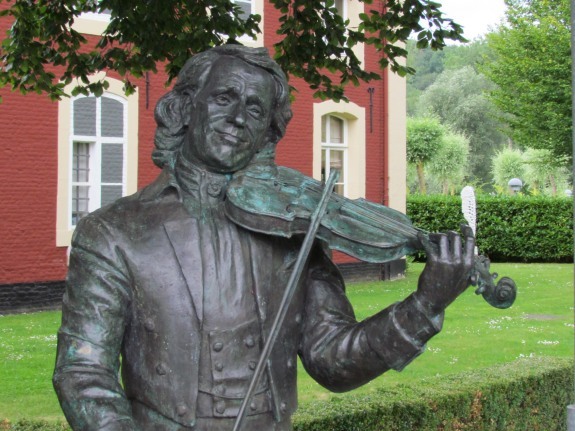 In 2012 we found the André sculpture back in the beautiful art park of Hotel Chateau Saint Gerlach (formerly a church and convent) in Geulhem, 12 Kilometers from Maastricht. 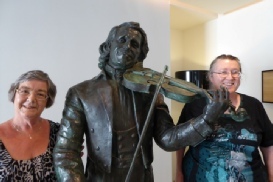 We were enchanted and thought this was the perfect place for the sculpture. In the pictures: Al Girard, Ruth Morgan. 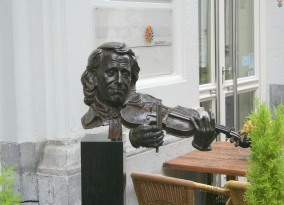 Fortunately we read in the Limburg newspaper in 2013 that the sculpture is still around: it was temporarily displayed in an art gallery in the Nieuwstraat in Maastricht during the TEFAF (art fair) weeks. 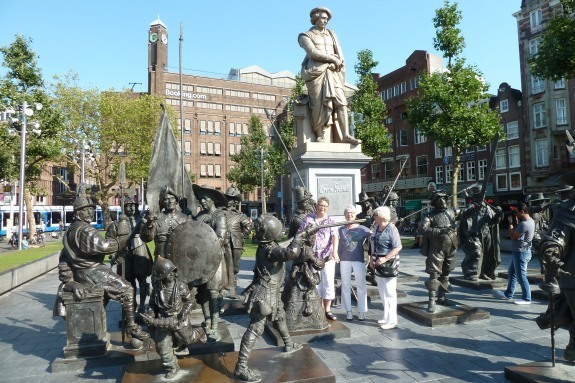 In the meantime several fans contacted the mayor and city council of Maastricht wanting to give the sculpture a nice and permanent place in Maastricht, but without result. 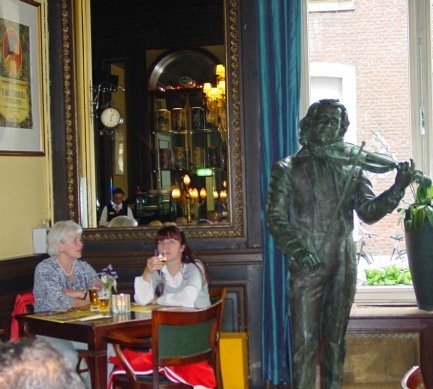 We did not hear anything anymore, until in 2014 the newspaper revealed that the sculpture was purchased by Leon Maes from Maes Real Estate and is temporarily housed in the Townhouse Hotel: St. Maartenlaan 5, in Maastricht, close to Maastricht’s railway- and bus station. 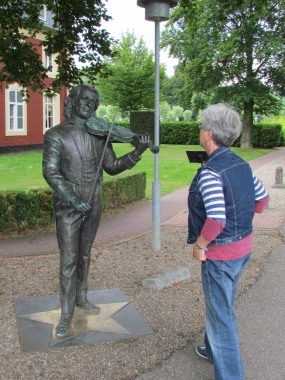 In June 2014 Ruud and I happened to be in Maastricht and we checked the location. Yes, here it is!! Ready for the fans to have pictures taken with André. It is in the entrance hall. The hotel has no restaurant, but you may have coffee there. We eagerly await the news as to where the permanent location will be! Walk over the ancient Servaas bridge straight ahead to the railway/bus station. Turn left at Hotel l’Empereur and take the first street left again. That is the Saint Maartenlaan. 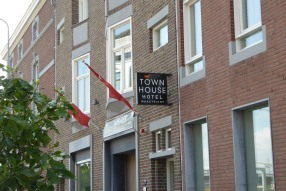 The hotel is at the corner, at number 5. The way back to the Vrijthof: Leave the hotel, turn right and then right again towards the railway station. 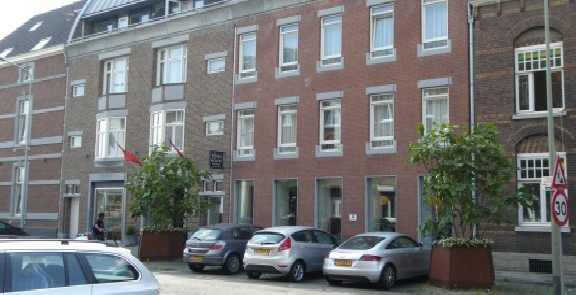 Turn right again at Hotel l’Empereur and simply follow this road back towards the Maastricht City Center. Great street for shopping! And guess what?? Visiting Amsterdam in September 2013 (with Elly and Inge van Kasteren) we bumped into a fantastic sculptured group of the Nightwatch, Rembrandt’s most famous painting. 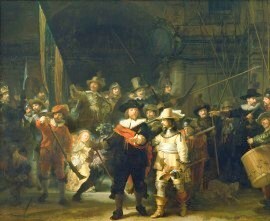 It was displayed on the Rembrandt Square, of course. Where else?? Why do I post this here? Because it is another work of art by….. 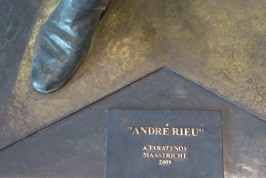 The sculpture disappeared in 2013. We had been told that the artist had taken it back. 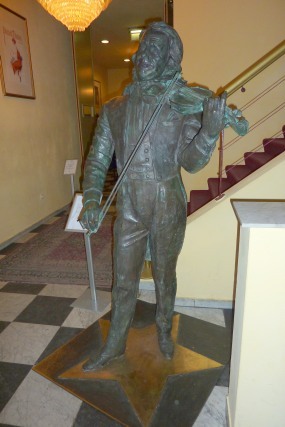 The only thing left was André’s head, hands and a violin, outside the Bonbonnière theater, like a sad leftover…. The fans were very disappointed, since they don’t like a beheaded André! They were worried that the rest of him had been melted down….. In the picture: Nadia Meys. 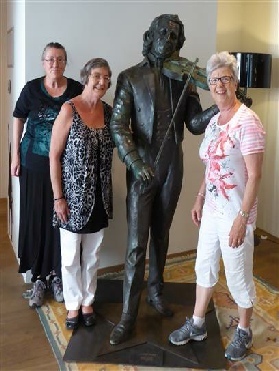 July 2014 / 2015: fans visiting André’s sculpture in the Townhouse Hotel. 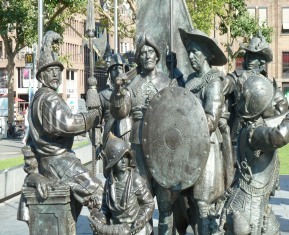 Maastricht. On May 31st 2015, the Limburg TV program L1mbourgeois broadcast an item about the Taratynov-family. The family has bought the abandoned empty castle “Strijthagen” in Landgraaf, another Limburg town near Heerlen (37 minutes by train from Maastricht railway station, departure twice an hour). The family restored the castle and turned it into an art gallery. The interview with Alexander Taratynov is in English language. 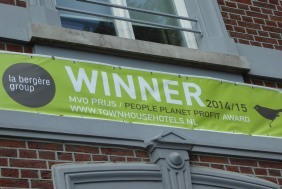 In July 2015 the sculpture was still in the Townhouse Design Hotel, in Maastricht. 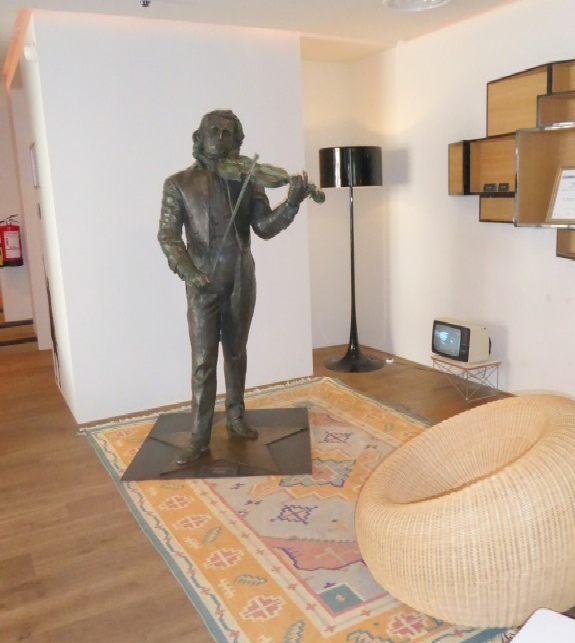 In October 2015 we received a notice from the Hotel, that André’s sculpture moved from the Townhouse Design Hotel to a newly built shopping passage in the Maastricht quarter “Wyck”, which is situated between the Maastricht train station and the old Servaas bridge. The shopping passage is realized between the “Rechtstraat” and the “Wycker Grachtstraat”. The “Wycker bazaar” is a shopping area with small shops like a bakery, a greengrocer, a florist and a bistro which serves local produce. It is built by Maes Real Estate and will be finished in the beginning of 2016. 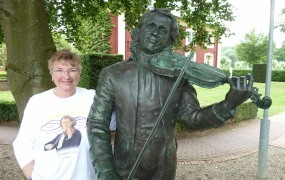 So in July 2016 you will find André’s sculpture there!